1. Consisting of five parts, or occurring in sets of five. 2. Sets of five, or the fifth member of a set. 1. Pertaining to, characterized by, the number five; consisting of five (things or parts). 2. Of or belonging to the fifth order or rank; fifth in a series. Used to describe leaves that occur in clusters of five. An arrangement of five objects in a square, with four at the corners and one in the center. Literally, "five" plus uncia, "a twelfth". A member of a body, commission, etc., of fifteen men; especially one of the priests who had charge of the Sibylline books. A government consisting of five hundred men. 1. The most important part of something: A musician told his audience that the quintessence of music is the melody. 2. A perfect example of something: Henry was the quintessence of calmness when his wife Mildred told him that their car had a dent in the fender because someone else had backed into it while it was parked at the supermarket. 3. 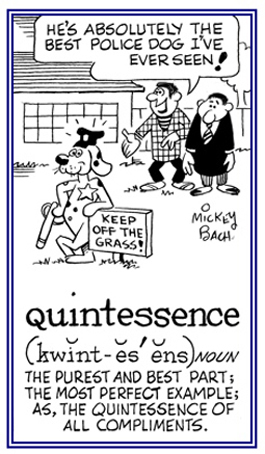 Etymology: from Latin quinta essentia, "fifth essence." © ALL rights are reserved. 1. Representing the perfect example of a class or quality; a perfect experience. 2. The essence of a thing in its purest and most concentrated form. 3. Being the most typical example or the most important part of something.